Here's how Google's helping vets find jobs and stay in business. Over 2.5 million U.S. businesses are owned by veterans. The new attribute through Google My Business was created to support veteran-owned businesses. Additionally, the Grow With Google tool makes it easier for veterans to find jobs. After doing one of the most important jobs for the U.S. and transitioning back into civilian life, finding a new calling isn’t always easy for veterans. But plenty of former service members have found a new mission: owning a small business. More than 2.5 million U.S. businesses are owned by veterans, according to data from the U.S. Census Bureau’s most recent Survey of Business Owners. To assist, Google has developed a specialized tool, which is designed to provide helpful benefits for veterans. Click to read about seven VA benefits every military family should know about. The tech giant has enabled this tool as a way to help veteran business owners connect with those who want to support their businesses. Sean O’Keefe, former staff sergeant in the U.S. Army and data scientist for Google, describes in a company blog post how the new Google tool works: “If your business is owned, led, or founded by a veteran, you can enable this ‘Veteran-Led’ attribute through Google My Business, and it will appear on your Google listing alongside other details like ‘Has Wifi’ or ‘Outdoor Seating. '” With this tool enabled by business owners, Google Search and Google Maps users will find it easier than ever to identify local businesses as veteran-led. O’Keefe also believes this attribute is a valuable tool for veterans, like him, who want to stay connected to the veteran community: “More than 2.5 million businesses in the U.S. are majority-owned by veterans, and one way that I stay connected to the veteran community is by supporting those veteran-owned businesses. 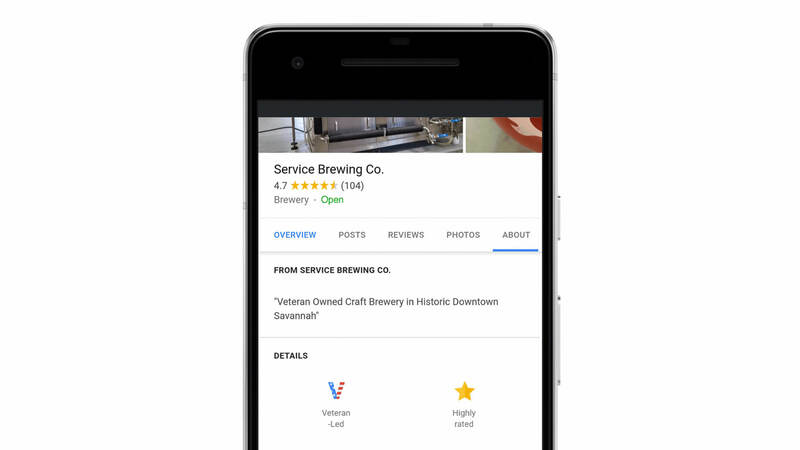 It’s something I can do all throughout my day, whether I’m grabbing a coffee or recommending a local restaurant to a friend.” Now, Google Search and Google Maps users will find it easier than ever to identify local businesses as veteran-led. Google has also implemented a career development program called Grow With Google. Although the program is open to all Americans, it’s especially helpful to veterans looking for relevant jobs. In 2017, 59 percent of the 370,000 unemployed veterans in the U.S. were ages 25 to 54. One initiative of Grow With Google is the ability use a combination of the search term “jobs for veterans” along with specific military job codes. Using these specific search terms will help veterans find civilian jobs that match their military skill sets. Another feature is the ability for veterans to enter military job codes on career sites that use Cloud Talent Solutions, such as CareerBuilder. Google also reported that Google.org is giving $2.5 million to the United Service Organizations to provide IT training, professional certification and career guidance to those transitioning out of the military, veterans and their spouses who desire to learn new skills. Click to keep reading about high-paying jobs you didn’t know existed. The Golden State is the first to abolish cash bail.